Nineteen Indigenous artists have pulled out all the stops this year to raise funds for Urban Native Youth Association (UNYA). These artists have joined Lattimer Gallery for their annual Charity Bentwood Box Auction. Every year for the past eleven years, Lattimer Gallery has held this bentwood box fundraiser, and as a result has raised over $375,000 for charity. We’re incredibly grateful at UNYA to have been Lattimer Gallery’s charity partner for several years now. This partnership has meant that some of our most underfunded programs have been able to continue offering support, resources, and opportunities to urban Indigenous youth here in Metro Vancouver. 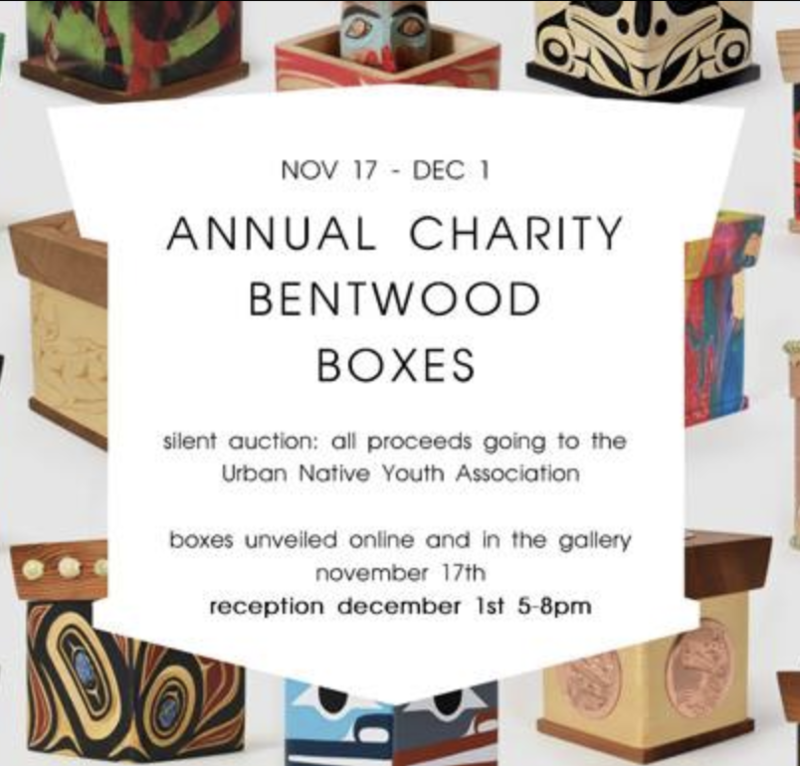 In addition to funding our current programming at UNYA, some of the money raised from the bentwood box auction are helping to secure a bright future for the next generations of Indigenous youth. While the funds that go to current programming provide immediate support for youth, the remainder will help make our vision for the Native Youth Centre a reality. The Native Youth Centre will be a regional hub for urban Native youth, at the corner of Hastings and Commercial. Creating this new youth centre will ensure that future generations of Aboriginal youth feel a greater sense of belonging here in Vancouver. It also ensures that Aboriginal youth will have access to programs, services, and opportunities that will support them to reach their fullest potential. 100% of funds raised from Lattimer Gallery's bentwood box auction support UNYA's current programming, and ensure that opportunities are there for future generations of Indigenous youth. All of the work that goes into making the bentwood box auction a success every year is donated: the small cedar boxes are steam-bent and constructed by Métis/Cree artist James Michels; the promotion and collected funds are donated by Lattimer Gallery; and all the artwork is donated by the artists. Every year, these artists push themselves and one another to transform the bentwood boxes into truly inspirational works of art. An air of friendly competition means that artists are constantly innovating, and every year they blow us away by the vision and creativity they bring to this fundraiser. Beyond the inspiration to contribute to a good cause, these charity bentwood boxes attract bids from collectors across North America who recognize just how unique these pieces of art are. Contributing artists this year include renowned artist Lawrence Paul Yuxweluptun, with his playful Thinking Outside the Northwest Coast Box, which calls to mind some of his recent sculptural work. This playful element is continued by Clinton Work, who incorporates unconventional materials and a few surprises inside his Lego My Box. Maynard Johnny Jr. shows us his keen eye for colour and balance with his Box of Salish Elements, making use of the crescent and trigon shapes that make Coast Salish design one of the most unique styles of art on the West Coast. Michelle Stoney’s Killer Whale Journey tells the story of a journey from up north Rez to the city, mirroring her own journey as an artist. Dean Hunt takes inspiration from the stars with the strikingly bold design on lu̓ḷ́x:lu̓ḷgḷís (the Heiltsuk word for “the Milky Way”). James Michels takes the concept of a bentwood box one step further, with his bent-bentwood box, Animated, which seems to move and dance in front of your eyes. These boxes and more can be seen on Lattimer Gallery’s website here. Bids are accepted by email, phone, or in person in the gallery. Bidding concludes at 8 pm on Saturday, December 1st, during the artists reception at Lattimer Gallery’s 1590 West 2nd Avenue location. Can’t bid on the artwork but still want to make a contribution? Make a donation to UNYA through the Bentwood Box Auction here. A charitable tax receipt will be issued to you immediately by email.